The local peak for winter sports is the Planai. A six-seater cable car with a middle station takes tourists up the mountain. The Planai consists of many "red" and "black" slopes for competitive skiers, and many "blue" slopes for beginners, but generally the Planai is an intermediate to expert mountain. The Hochwurzen is the other mountain in Schladming. It has three main red runs off the four-man chair lift and a sledge run. This mountain is better suited to more experienced boarders and skiers. Also, a 15-man cable car can take groups of up to five to the top. The surrounding mountains are popular with climbers and hikers and country lovers. In the summer, downhill toboggan runs and an outdoor swimming complex are open. The UCI Mountainbike Worldcup has taken place in Schladming since 2004. In 2010, the Mountainbike Worldcup in Schladming was relocated to Leogang due to construction work taking place for the Ski World Championships in 2013. The first official mention of the settlement on the site of today's Schladming dates back to 1180. First name of the town was Slaebnich which is of Slavic origin (Slovenian; Slabnik, Slapnik). 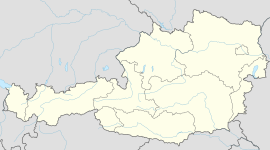 In the early and high middle ages, the place, like the whole of Styria, belonged to the settlement of the Alpine Slavs and was part of the Slavic principality of Carantania. During the period of German colonization, the place gradually acquired a Germanic character, although many Slavic elements were preserved in culture and language. A bus service runs up and down the Planai and surrounding mountains throughout the year. Many ski lifts are on the mountains, some catering especially for small runs. Since 1973, the Planai has been a regular location for Alpine Ski World Cup races. Since 1997, the race has been called a "Nightrace" because it takes place at night. In 1982 and 2013, Schladming hosted the Alpine World Ski Championships. In March 2017, Schladming was one of the host towns of the 2017 Special Olympics World Winter Games in Styria, Austria, together with nearby Ramsau am Dachstein and Graz. This page was last edited on 26 March 2019, at 18:00 (UTC).